I took my Uncle Steve to the Farmer's Market for the first time. He is always eager and excited to try something new- I love his attitude! So, I did what I do best- took him to all my favorite vendors, and watched his eyes light up as he tasted everything. Success! See another HNL Farmer's Market post HERE. As soon as we got there, I bought some Sea Asparagus Lomi which was absolutely delicious. Made with only 3 ingredients and NO MSG, it can be an extremely healthy snack OR even poured over poi (as I imagined eating it). Taste a sample, and you will notice the salty flavor. Trust me, it's not MSG. The lady explained that sea asparagus is grown in salty water, so it's au natural. Then they just add tomato and onion to finish off the Lomi. Such a deal at just $5. I also bought my favorite tomatoes from Ho Farms. Currants. Gah, I'm hesitant to even write it on here for fear of it being bought out next time I go, but what the heck, share the wealth! As we advanced through the market, I took Uncle Steve to get my favorite juice. I still don't really know the name of the vendor, but she always has fresh juices that I'm never disappointed with. 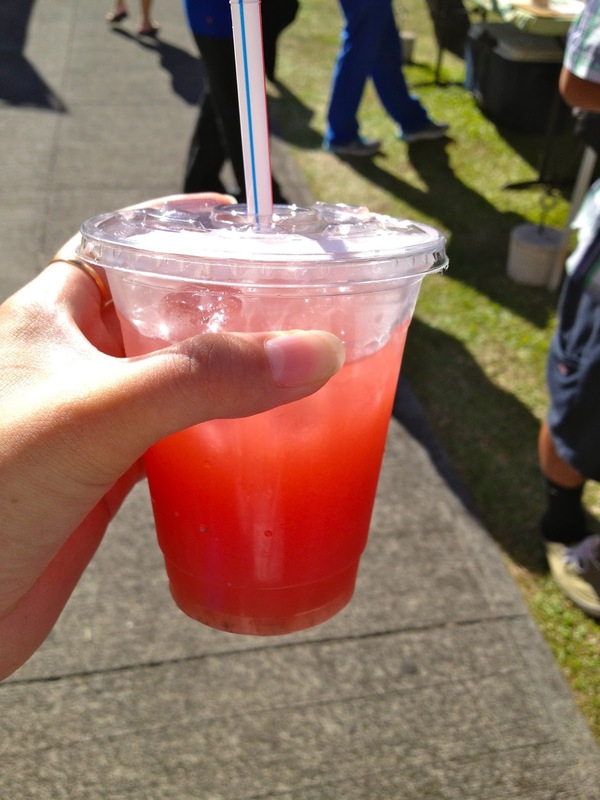 This past week she had "Strawberry Watermelon Rose" juice. Amazing! My next stop is always a must as well. Grilled Kona Coast Abalone! Yep, we got 4 orders (8 shells) of those buggers!! Yummy! After visiting all my favorite vendors to pick up the essentials (juice and abalone! ), we made our way to Pig and the Lady. I told Uncle Steve "We need to get to Pig and the Lady, order, and get seats before they're all taken!" So Uncle Steve shuffled through the crowds a little quicker. One order of Canh Chua Chay and an order of their Special this week, Bucatini Pasta. My goodness, the Bucatini was AMAZING. I'm going this Wednesday again to have that exquisite, heavenly pasta with beef tendon and pickled beets. Be sure to mix it all up- the beautifully-vivid pink and green sauces are all the bottom! You will not be disappointed if you order this dish! One of my absolute favorites so far from Pig and the Lady! !